A few changes that were needed, were the addition of a nest box, move the access door to the center, handles for easier moving, a place for the waterer, wider and shorter for fitting in the back of a pickup truck. The new design has a 4 x 8 floor plan foot print, so it can be hauled in the back of my truck. The handles are part of the roof framing that extend past the roofing. Skids on the right side are the wall framing extended past to provide a place to attach some wheels. The door is in the center this time, so I can access the coop section, without crawling in from the end. There is a platform for the waterer on the door, so it is easy to get in and out of the run. A 36" piece of 4" plastic pipe, with two elbows on the bottom, is the feeder. The nest box is made from 1/2" plywood and is removable without tools. This gives an easy access to the coop. The box is built to fit through the hole and drop down into place. The lid has no hinge to leak and locks the box in place with the notches at the top keeping it from being pushed in, or lifted up. It is secured to the box frame at the bottom end by a simple gate hook. 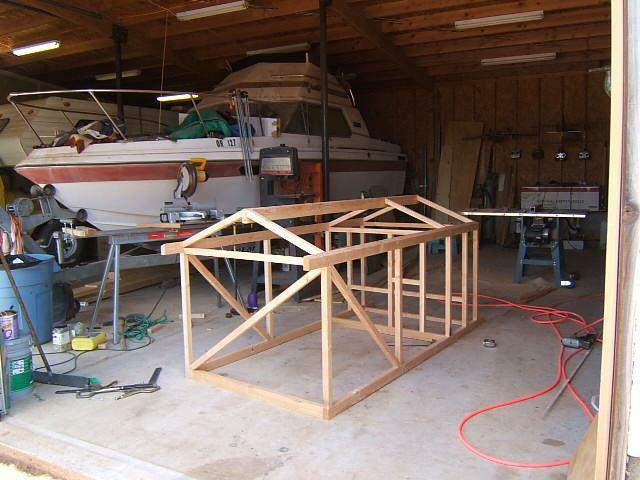 The framing is 2 x 3s for the tops and bottoms of the sidewalls (ripped from 2 x 6), 2 x 4 ridge with a 22 1/2 degree bevel for the 5/12 pitch roof and 2 x 2s for all other members (ripped from 2 x 4). I have a 1" crown stapler that was used for framing, side stapled the way RVs used to be built. 3"~ 3 1/2" deck screws would be a good substitute. The side wall height was kept at 35", so the 3' wire (I used stucco wire - my bad) could by wrapped onto the top framing and be additionally secured with the roofing panels. The bottoms and end were stapled with a wide crown stapler and 1 x 2 strips attached over that. The siding is corrugated roofing removed from a remodel project. I always see projects people have done by salvaging, scrounging and stealing materials, without ever telling what it would cost to just run down to Home Depot, or wherever and buy the supplies. Easy to build, simple design, and great materials list. Would be good for a rooster or maybe quarantine pen. 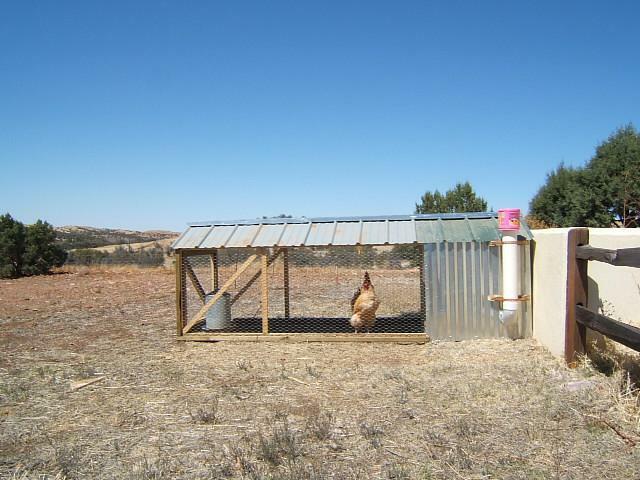 I love the simplicity of this coop, but I dont think i would put more then 2 or 3 in it. how many chickens do you think this could fit?